ipod 30GB A1136 scratched and shows ware, the button in the middle seems hard to push not sure how to turn it off, it may have issues or I don't know how to work it, I can charge it and listen to music. Condition is Used. Shipped with USPS First Class Package. as is no return. Apple iPod classic 5th Generation Black A1136 (30 GB) USED Cracks/Spots PV9M. Very Used Condition - iPod has heavy scratches on display and body. You will receive the listed iPod only. iPod Classic. Trending at $41.48eBay determines this price through a machine learned model of the product's sale prices within the last 90 days. Trending at $59.32eBay determines this price through a machine learned model of the product's sale prices within the last 90 days. 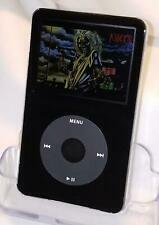 Apple iPod classic 5th Generation Black 30 GB Only tested to see if it powers up. No further testing. This iPod has music still on it. New ListingApple iPod Classic 5th Generation 30GB (A1136) - Fully Functional! 4.5 out of 5 stars - Apple iPod Classic 5th Generation 30GB (A1136) - Fully Functional! 1,069 product ratings1,069 product ratings - Apple iPod Classic 5th Generation 30GB (A1136) - Fully Functional! iPod is in used cosmetic condition with normal to heavier signs of cosmetic wear throughout the device. The unit will contain heavy scratches, and scuff marks/dings, especially on the back of the unit! The device is free of any cracks/chips (for units with LCD screens). Device is in 100% working condition, fully functional. APPLE Limited warranty has expired. This listing includes the iPod, and generic USB data sync cable. Photos are for generic purposes only and are not the actual device you will receive. Reformatted with a Mac. May not be recognized by Windows 10!”. 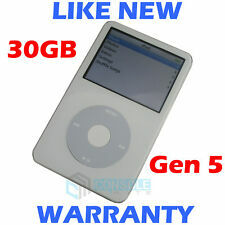 Used Apple iPod classic 5th Generation White 30GB A1136. Tested and works great. Comes factory reset and ready to use. No cables included. Minor scratches, but in great shape for its age. Includes generic charging cable and used apple ear buds. Has a lot of scratches and wear. Brand New Front&Back +650m Battery +256GB Flash Drive! Two Apple Ipod 5th Generation 30 GB A1136 Black and white. Condition is Used. Shipped with USPS Priority Mail Small Flat Rate Box. Apple iPod A1136. Shows signs of wear, scratches/scuffs. See pictures for condition. The ipod Has Wear from use minor dents, Dings, Scratches and scuffs nothing major. We fulfill orders M-F each week. It has Been factory reset using itunes. Works well and all original! Apple iPod Classic 5th Generation 30GB (A1136). Condition is Used. Shipped with USPS First Class Package. This iPod is a used and in working condition. There are scratches and scuffs from normal use. It connects to iTunes. This iPod features the Wolfson audio chip offering great sound. Nothing that affect the functionality of the unit. Apple A1136 iPod Classic 5th Gen, Black, 30GB, MP3 Player, Tested. This item is in used condition and it does work. This item does have a few lines in the lcd screen. This item does have some cosmetic wear, scratches. If you have any questions please ask seller. Shipping will be Free. Tested Working. Does have wear and tear scratches and scuffs all over the unit, does not interfere with playback. Model#1136. HAS OLD SCHOOL RAP PRELOADED SONGS. IPOD ONLY, NO OTHER ACCESSORIES INCLUDED IN SALE. SOLD AS PICTURED. Apple iPod Classic 80gb A1136 5th Generation Black With 184 Christian Rap Songs. Tested and Working Perfect. Has Cosmetic Wear Seen In Photos it also has a protective glass sticker over the main display. Fast Shipping Guaranteed! Apple iPod classic 5th Generation U2 Special Edition White (30 GB) Tested. Condition is Used. Includes ipod, wall charger, computer cord, and case. See pics for scratches. Shipped USPS; shipping is free. No international shipping. Apple iPod Classic 5th Generation White 60 GB A1136 Tested And Working! Apple iPod Classic 5th Generation White 60 GB A1136 Tested And Working!. Condition is Used. Shipped with USPS First Class Package. Used but in excellent condition. It’s super clean fully tested and works perfectly. Unit only, no usb or headphones included See the photos please. It’s sold exactly as you can see it there. Apple iPod A1136 5th Generation 30GB White, Tested, Works! Apple iPod A1136 5th Generation. Capacity: 30GB. iPod has dents in back and lots of scratches. Front of iPod is beginning to separate sightly. During tests, battery lasted about ~10 hours.Does not include USB cable. Apple iPod classic 5th Generation Black 30GB MP3 Player. MODEL: A1136. 30 GB ~BLACK~. 5,305 SONGS. MOST OF THE SONGS LOOK TO BE LATIN. IPOD CLASSIC. We take multiple accurate pictures of every item listed. 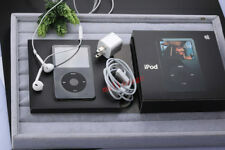 Apple iPod 30gb 5th Generation Black A1136 Condition is Used. See photo for condition. Works well item has significant signs of wear. Apple iPod Classic 5th Generation 30GB MP3 Player A1136 Black Tested. Condition is Used ipod only no cables , screen when lid up shows some black lines once the light turns off the screen is clean. Unit was tested and work due to the screen will sale this As Is . Shipped with USPS First Class Package. Take your music with you wherever you go! This iPod unit is used with a few scratches and scuffs to the casing as well as a blemish on the screen (see photos) - this blemish does not impact function at all. It has been tested and is in working condition (battery is not guaranteed). Listing is for one (1) iPod unit only - there are no cords or cables. Apple IPOD CLASSIC - 5th Generation / 5G - 30GB - White - NEW Housing + Battery!